Cheng, who is a 3 years and 6 months old boy, joined our class in April, 2015 when he was 11 months old. He has Cerebral Palsy (CP) caused by childbirth. The damage has affected multiple areas of the brain including his body movement, muscle coordination and speech & language impairments. “I still remember what I felt when the doctor told me that my baby had to receive the early intervention due to developmental delay. I had no idea what to do and so much worries about my baby and his future. Thanks God! I got the advices from the doctor and he encouraged us not to give up and there would have opportunities to change this situation. I really appreciate the assistance from TFCF Taichung City Child Development Center. They found Cheng showed slightly higher levels of sensitivity to musical instruments, and he could participate successfully in music learning. All teachers and social workers put lots of efforts on developmental delay children. Now he is one of TFCF Children's Talent Show Members and is able to say “love you” to me! ** Cheng is the fake name due to the privacy and safety of individuals is respected. 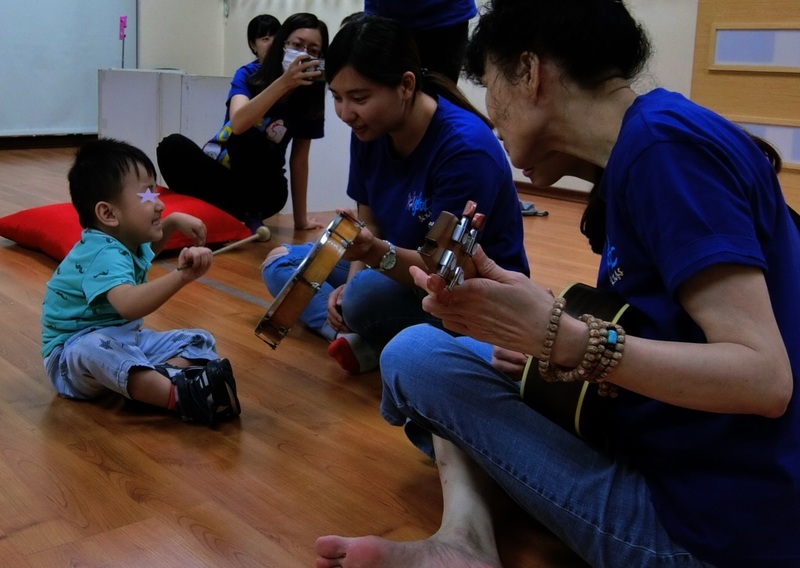 We keep to carry on around 70 children through the music therapy program monthly. We expect to provide the non-stop services and bring the non-stop growth to our children. We’ve purchased a sensory sound board and a colored lights board of sound-level meter this year, and both of them are popular to children and improve their participation in the class. All the donations you give are very important and help many children like Cheng who has the incredible progress in few years. I believe children’s smiles are the best Christmas gift to all of us every year! We insist to help developmental delay children re-build their potential and self-confidence and bring hopes to their families through children’s progress. We are immensely grateful for your support and would like to thank you for all your help throughout the year. With your most generous donations, we make children’s dream come truth and they are encouraged to move further next year. We are committed to providing a consistently high standard of professional service to children and enrich our programs to help children grow. We are proud of them and thank you for giving the opportunity for developmental delay children.